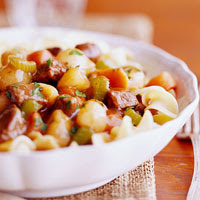 Burgundy adds a touch of sophistication to this stew's deep mellow blend of mushrooms and vegetables. It makes a hearty dinner when served over noodles or garlic mashed potatoes. Lightly coat a large skillet with cooking spray. Brown beef, half at a time, over medium heat in the skillet. Drain off fat. Place frozen vegetables in a 3-1/2- or 4-quart slow cooker. Place beef on vegetables. Combine soup, wine, water, and tapioca; pour over beef and vegetables. Cover; cook on low-heat setting for 7 to 9 hours or on high-heat setting for 3-1/2 to 4-1/2 hours. To serve, spoon beef mixture over cooked noodles. Sprinkle with parsley. Calories 291, Total Fat 8 g, Saturated Fat 3 g, Monounsaturated Fat 2 g, Polyunsaturated Fat 0 g, Cholesterol 91 mg, Sodium 535 mg, Carbohydrate 14 g, Total Sugar 3 g, Fiber 1 g, Protein 34 g. Daily Values: Vitamin A 0%, Vitamin C 2%, Calcium 1%, Iron 23%. This entry was posted on 5:53 AM and is filed under Heart Healthy . You can follow any responses to this entry through the RSS 2.0 feed. You can leave a response, or trackback from your own site.